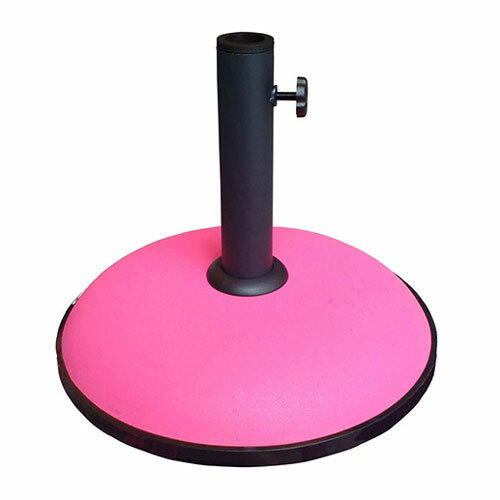 Norfolk Leisure Concrete Parasol 15kg in Fuschia Pink design supports any free standing garden umbrella of 2.5 metres diameter or less. 'Fuschia' colour shade concrete is designed to perfectly compliment Norfolk Leisure Lotus or Geisha 'Fuschia' design Parasols. Parasol base benefits from an adjustable tube option to accommodate any smaller pole diameter up to 40mm. 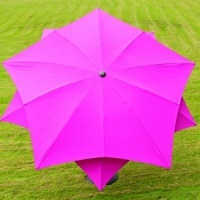 Having recently moved and then purchasing a 6 piece patio set, in fuchsia, all I required was a parasol base. I never thought I would actually find a base to match my set but I did and Bosworth's were offering the best price by far! Delivery was unbelievably quick too as I was shocked when it arrived the very next day. Yes the base is extremely heavy but it is concrete and of course mine is fuchsia, a gorgeous colour (many other colours are available too). Very easy to assemble as there are step by step instructions (which I didn't need due to the simplicity). An all round excellent product that I would highly recommended and with a fantastic service from Bosworth's.